moco is making their bikes more sophisticated so to get you into their service dept. I prefer a bike that is mechanic friendly. i would get a honda grom over this. don't need a bike with a computer or antilock brakes altho i see a lot here want that. The Grom is EFI, ergo has a computer. And may well be no easier to service, but time will tell. The Boutique stores were for the RUBs, I agree. But they also are what put HD where they are today. Without the Boutique stores HD would be a 2nd string motorcycle company trying to compete with newer technology, with the stores they are a American Icon that has made cruiser motorcycles a status symbol. Boutiques are for marketing and customer service. Neither of these are limited to RUBs or Harley (see some BMW dealers, or Ducati). And neither is necessarily a bad thing. As usual you bring in a balance to my fast put together post. My answer to it is that we are talking about marks that are not the normal generic motorcycle, Remember in the USA ford, chevy and dodge are the common mans car with others being the ones yo strive for. Well it seems that in the Moto world that suzuki, yama, honda, and kawa fill that void, and others such as the Duck and HD are higher end bikes. IF we think of it that way, then we understand the problem HD has by owning a segment that is basicaly cruisers. And then we can understand why they have to answer to these other markets. When one market takes a decline you need to enter new territory. Here is the challenge HD has, Enter a new market and refuse to chase the HP wars. Instead improve your line each year to make it better. Harley is very good at that, they have defined a class of motorcycle in 3 categories, Touring, heavy weight road bike, and a all around great middle class. I see the future of bikes such as the Pan American and the Street fighter being that they introduce a good middle of the class bike and then refine it till they have a great platform you can totally depend on. Sheesh look at the GW or BMWs touring machines, Even the flying fortress inspired MG. but the Touring class of HD are Icons. Harley knows its market, it is not the newest or greatest, it is the bike you buy and love, the bike that stays with you, the bike that you will buy another of in 10 years. Their market segment is all about heritage, lifestyle and style on the outside, but the part that we all have to agree is that the image there is just on the outside, we love these bikes because Harley offers long term commitment to a platform and making that platform a refined vehicle we can use for years, not trade off every 3rd year because it is outdated. In that spirit, the Pan American will be a platform that will be viable to own in 15 years, not something that we trade in because it is out of style and has parts that are so cheap they did not last the first year. What we have to accept is That we never bought our HDs as cheap replaceable bikes, we bought them as commitments to a platform we love and wanted HD to be the moniker on it. That is what HD needs to find a way to communicate to the next generation. And when I typed it I was also thinking about a recent car shopping experience, the wife is looking at a Lexus. Hands down probably the best shopping experience I can remember, absolute customer service, no pressure, no smarmy. Makes it a strong contender, even if a little more than some other cheaper and more common brands. 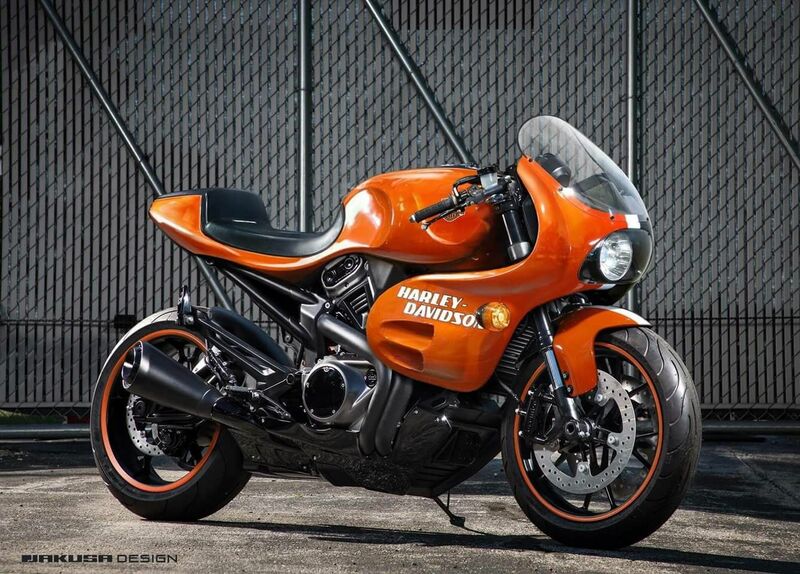 interesting photoshop of the streetfighter. nice throwback to imo harley's best bike ever. Actually the should have continued building tuber Buells. I dig it. Gotta try some new things (for Harley) and keep the brand fresh. I wouldn't trade my Sporty for one, but I would park the two next to each other if I could afford it. I remember, 20 years ago, complaining that they should have put the V Rod engine in the Sportster chassis. I stand by my stance to this day. This new bike could have been the third generation since then. It would have been quite refined by now and fully accepted as a Sportster. As it stands, HD is 20 years behind the 8 ball. The US is a huge market but the future is global. Ya might not like that, but it's coming. The guys that want to buy this type of bike, with this engine, were toddlers 20 years ago.